Suzuki Motor Corporation is a Japanese multinational corporation headquartered in Minami-Ku, Hamamatsu that manufactures automobiles, four-wheel drive vehicles, motorcycles, all-terrain vehicles (ATVs), outboard marine engines, wheelchairs and a variety of other small internal combustion engines. The worldwide sales volume of the automobile is the world's tenth largest, while domestic sales volume is the third largest in the country. Suzuki’s domestic motorcycle sales volume is the third largest in Japan. The Suzuki Motorcycle India has announced an all-new Hayate EP for the Indian two-wheeler market. The Hayate is a commuter bike from the Japanese bike maker and is aimed at office goers as it not only maintains the style statement. he new Suzuki Hayate EP is well equipped with a number of innovative technologies. Suzuki Hayate EP bike made its public debut in the country at the 2016 Delhi Auto Expo. Suzuki Hayate EP features a longer seat that ensures a comfortable ride for both the rider and pillion. This bike is based on a brand new diamond frame; the bike comes with a long wheelbase and offers comfort without compromising on stability. The bike is equipped with a maintenance-free battery, 5-step adjustable rear shock absorbers, and tubeless tires. Suzuki has added prominent lines on the fuel tank and tail of the bike. It also gets sporty mirrors and new body graphics. In addition to the few new fitments, it carries forward a bunch of features from the predecessor. There is a preload adjustable rear suspension, alloy wheels, tubeless tires, drum brakes, a long seat etc. It also has the longest wheelbase and a brand new diamond frame, which gives the rider utility and comfort plus unmatched stability. The new Hayate EP sports powerful and edgy lines on the tank and tail, sporty mirrors and stylish new graphics that give the motorcycle an exciting look. Alloy wheels and tubeless tyres on the bike are best for ease of ownership and maintenance. The Large bright multi-reflector headlamp and indicators along with the sharp and aggressive look and bright and broad reflectors with excellent illumination are for safe night riding. The extended Swing Arm and Wheel Base are provided for the improved straight running stability of the bike, even with a passenger. The Suzuki Hayate EP will be offered with three paint jobs- Metallic Oort Grey, Glass Sparkle Black and Pearl Mira Red. Suzuki Hayate EP is equipped with Suzuki’s edge EP means Suzuki’s Eco-Performance technology. This technology comprises of Super Sleek Piston, low friction cylinder, high-ignition spark plug and piston rings. With this technology, the bike achieves improved combustion, reduced friction, high compression ration and reduction in weight. The Suzuki Hayate EP is powered by 113cc single-cylinder, air-cooled engine that churns out 8.3bhp of power at 7,500rpm along with 8.8Nm of torque at 5,500rpm. This engine is paired with a four-speed gearbox. Weighing in at 114kg, the Suzuki Hayate EP boasts of a good ground clearance of 165mm. The Dual 5-step adjustable Rear suspension of the bike has 5-way preload adjustable suspension, for added stability and flexibility for varied riders and riding conditions. The new engine of the Suzuki Hayate EP is powered by the SEP technology that it has All aluminum 4 stroke engine powered by cutting-edge Technology, which boasts top-class fuel efficiency without compromising power and performance. The Suzuki Hayate EP appeals to every modern Indian rider. 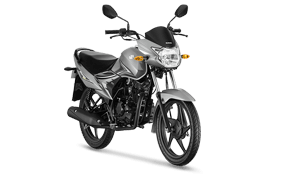 Available in an electric and kick-start versions; the Suzuki Hayate has been priced competitively against its rivals. This ride offers an easy travel as well as more stability for both the rider and the passenger. It is fed by a VM17 carburetor, this workhorse from Suzuki offers oodles of comfort and neutral handling. Hayate EP uses the Suzuki Super Sleek Piston, high-ignition spark plug, and low-friction cylinder and piston rings. This aids in improved combustion, high compression ratio, reduced friction and weight reduction and hence it is highly preferred by the riders. Suzuki Hayabusa prices start at Rs. 14.00 lakh (Ex-Showroom). Suzuki Hayabusa is available in 1 variant and 3 colors.